Even with its fanciful world of characters skilled at bending air, bending fire, bending earth, and bending water, The Last Airbender winds up breaking wind. I ran away, but I’m back now. It's something Hollywood does well: milk a good thing as quickly as possible. DVDs supplanted VHS tapes with the lure of extravagant supplemental features and improved picture and audio quality. One side of the disc would have the widescreen movie and the other side would have a pan-and-scan version. But, before long, widescreen and pan-and-scan became separate discs, taking up more shelf space. Then some movies didn't even get the widescreen remastering they deserved and the promise of superior technical quality got mired in the bog of laziness. The Commitments was one example, until Fox double-dipped and finally coughed up a widescreen transfer years later. Now Blu-ray is replacing DVD with similar promises and already Hollywood is burning consumers with shoddy, low-res transfers in a high-def world. Take Gladiator, please. A newly-remastered edition is expected this fall, one year after Paramount's Sapphire edition failed to impress with a substandard transfer. And 3D is a way studios can get audiences to part with more of their money by charging premium ticket prices. Already this year two movies have provided incredibly inept 3D experiences that are nothing short of a rip-off. Clash of the Titans received a lot of flak for its poor 3D effects work and now The Last Airbender joins Hollywood's Walk of Shame. Sure, the CGI opening titles look nice in 3D. But other than that, there's precious little in terms of the 3D sensation. And, really Paramount, with all the fire bending and special effects work, isn't it obvious there should be a much richer sense of depth at the very least? Did anybody at the studio sit down and watch this thing in 3D? Doing so, and pulling the plug on the 3D angle, could've saved the studio some embarrassment. As for the movie itself, there's plenty to be embarrassed about in good ol' 2D. There was hope going into The Last Airbender. Right from the start, it had two things going for it. First, there was the likelihood audiences wouldn’t be tortured with another horribly self-serving cameo by director M. Night Shyamalan; his Lady in the Water represents a low point for directors arrogantly miscasting themselves with speaking roles. Second, while it was written, produced, and directed by M. Night Shyamalan, it’s based on the popular Nickelodeon cartoon series, so the odds were in favor of something interesting happening. To put a positive spin on it, the movie goes one for two. There’s no Shyamalan cameo, but nothing interesting happens. The TV series was titled Avatar: The Last Airbender; “Avatar” was dropped from the movie version to avoid “confusion” with another movie released late last year that wound up making quite a few bucks at the box office. The world of the airbender is nothing like the peacenik planet of Pandora. This world is divided into four “nations,” representing the four elements: air, water, earth, and fire. The master of all four elements is called the Avatar, but the boy who would be that Avatar, Aang (newcomer Noah Ringer), pulled a disappearing act because he was upset after being told he’d have to sacrifice a normal life – he couldn’t have a family – once he committed to being the world’s Avatar. The young Avatar-to-be somehow winds up frozen for 100 years. During that time, his tribe of peaceful, loving monks is annihilated. He gets rescued by a couple kids and takes on the evil forces of the Fire Nation. With the threat of death off the table, Aang’s biggest problem is he never finished his training before running away in a huff. He can bend air, but he never mastered water, earth, and fire. That’s the set up. Unfortunately, there’s no payoff. The Last Airbender is one plodding, joyless, lifeless affair full of flying animals, magic, mysticism, holistic attitudes, and a sweeping score by James Newton Howard that is the movie’s only real emotional source. At least the music indicates when something emotional or big is supposed to be happening. The best thing that can be said is that the movie – at least at times – is interesting to look at. But, as with Clash of the Titans, the 3D upsell should be avoided. The bad overwhelmingly outweighs the good. Shyamalan, more accustomed to smaller, creepy, Twilight Zone-style stories, can’t muster the mojo to bring this effects-laden extravaganza to life. In the early going of his career, Shyamalan held out a lot of promise as being a talented writer-director. The Sixth Sense and Unbreakable were a formidable one-two punch. But, my, how far the Nightman has fallen. His career trajectory is veering less toward being the next Steven Spielberg and more toward being the next Ed Wood. For starters, based on the incredibly tin-eared dialogue uttered in The Last Airbender, it sounds as though Shyamalan hired George Lucas, the seemingly tone-deaf Jedi master of awful fantasy dialogue, as this movie’s dialogue coach. And there’s Katara (Nicola Peltz, Deck the Halls), who tells her back story while posturing before a one-on-one fight by saying, “My name is Katara and I’m the last water bender left in the Southern Water Nation.” Is telling a vengeful Fire Nation guy you’re the last of your kind a smart thing to do? Or was that for the audience’s benefit because so little of the silly, shoddy story is told with any degree of coherence? Whatever the case may be, bad dialogue delivered badly makes for a bad night at the movies. And a special note of shame goes to Dev Patel, who plays Prince Zuko, one of the baddies. The Slumdog Millionaire sensation overacts like he’s in some kind of big-budget high school play. There’s no doubt it all ties back to crummy direction. C’mon, M. Night Shyamalan. What’s on display here is one really bad B movie that, disgracefully, was made with a big, A+ budget. 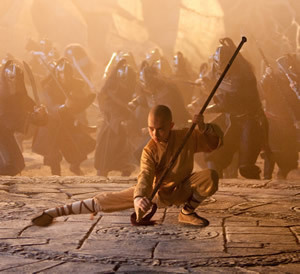 Cinematically, The Last Airbender feels a lot like The Golden Compass. Both have some nice visuals (although Compass easily tops Airbender in that department), but both lack the movie magic that should overflow from their fantastical story ideas. More importantly for Shyamalan, both purported to be the start of a whole new franchise. The Last Airbender goes so far as to include an opening title card stating “Book One: Water” and a final, fade-to-black scene that promises more to come. For the superstitious, it’s bad luck to announce something as a “First Annual” event. Along the same lines, it’s not smart to label something as “Volume One” when subsequent volumes aren’t yet done. Remember George Michael’s Listen Without Prejudice: Volume One? Decades later, Volume Two is still out of earshot. But here’s the kicker. When Lucas first released Star Wars, there was no assumption of success. It was simply called Star Wars. Episode IV: A New Hope was added in for a rerelease after the green light was given for more chapters. Those were humbler days for Lucas, but they served him well. Shyamalan has said he’d really like to have a franchise to call his own. Surely he had something like Harry Potter or Twilight in mind. But, after this half-baked debacle, he might want to consider something requiring less strenuous baking skills. Perhaps a Subway or a Burger King.